This gift basket includes a variety of snacks and drinks including: Angelina's Sweet Butter Cookies, Sesame Water Crackers, Gourmet Columbian Ground Coffee, Brown & Haley Almond Roca, Mixed Nuts, Truffini Hazelnut Chocolate Bar, Classique Cocoa Truffles, Earl Grey Tea, Garden Vegetable Cheese Spread and English Breakfast Tea Presented in a "Dr. Bag" Gift Box. Assortment may vary. This gift basket is a great way to let someone know you are thinking of them while they are ill or recovering from surgery! All of our gift baskets are wrapped in cello and decorated prior to shipping or delivery. We also include your personal message on the enclosure card. 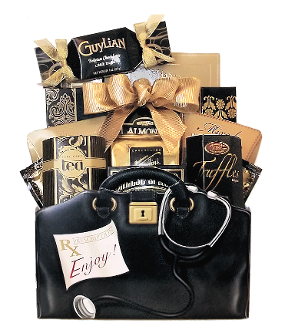 Thoughtful Expressions Gift Baskets designs gift baskets year-round for all of your personal and corporate gift occasions. We offer local delivery within Fort St. John and Canada wide shipping.